In photography and videography, a filter is a camera accessory consisting of an optical filter that can be inserted into the optical path. The filter can be of a square or oblong shape and mounted in a holder accessory, or, more commonly, a glass or plastic disk in a metal or plastic ring frame, which can be screwed into the front of or clipped onto the camera lens. Optical filters are used in various areas of science, including in particular astronomy; they are essentially the same as photographic filters, but in practice often need far more accurately controlled optical properties and precisely defined transmission curves than filters exclusively for photographic use. Photographic filters sell in larger quantities at correspondingly lower prices than many laboratory filters. 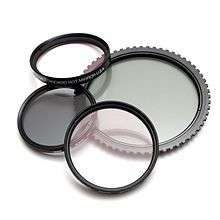 The article on optical filters has material relevant to photographic filters. In digital photography the majority of filters used with film cameras have been rendered redundant by digital filters applied either in-camera or during post processing. Exceptions include the ultraviolet (UV) filter typically used to protect the front surface of the lens, the neutral density (ND) filter, the polarising filter and the infra red (IR) filter. The neutral density filter permits effects requiring wide apertures or long exposures to be applied to brightly lit scenes, while the graduated neutral density filter is useful in situations where the scene's dynamic range exceeds the capability of the sensor. Not using optical filters in front of the lens has the advantage of avoiding the reduction of image quality caused by the presence of an extra optical element in the light path and may be necessary to avoid vignetting when using wide-angle lenses. Clear filters, also known as window glass filters or optical flats, are transparent and (ideally) perform no filtering of incoming light. The only use of a clear filter is to protect the front of a lens. Normally, the glass or plastic of a camera lens is practically opaque to short-wavelength UV, but transparent to long-wavelength (near-visible) UV. A UV filter passes all or nearly all of the visible spectrum but blocks virtually all ultraviolet radiation. (Most spectral manipulation filters are named for the radiation they pass; green and infrared filters pass their named colors, but a UV filter blocks UV.) It can be left on the lens for nearly all shots: UV filters are often used mainly for lens protection in the same way as clear filters. A strong UV filter, such as a Haze-2A or UV17, cuts off some visible light in the violet part of the spectrum, and has a pale yellow color; these strong filters are more effective at cutting haze, and can reduce purple fringing in digital cameras. Strong UV filters are also sometimes used for warming color photos taken in shade with daylight-type film. A few lenses, such as some of Canon's L series lenses, require the use of a filter to complete their weather sealing. The two additional reflections at air-glass interfaces inevitably result in some light loss—at least four percent at each interface, if the surfaces are uncoated; they also increase the potential for lens flare problems. 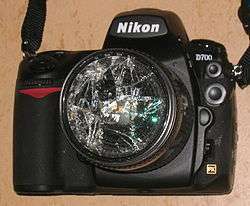 A filter may be incompatible with the use of a lens hood, since not all filters have the required threading for a screw-in hood or will allow a clip-on hood to be attached. Adding a lens hood on top of one or more filters may space the hood away from the lens enough to cause some vignetting. There is a wide variation in the spectral UV blocking by filters described as ultraviolet. Appropriate color conversion filters are used to compensate for the effects of lighting not balanced for the film stock's rated color temperature (usually 3200 K for professional tungstens and 5500 K for daylight): e.g., the 80A blue filter used with film for daylight use corrects the perceived orange/reddish cast of incandescent photographic photoflood lighting (for which the usual photographic term is "tungsten lighting"), and significantly improves the stronger cast produced by lower-temperature household incandescent lighting, while the 85B will correct the bluish cast of daylight photographs on tungsten film. Color correction filters are identified by non-standardised numbers which vary from manufacturer to manufacturer. The need for these filters has been greatly reduced by the widespread adoption of digital photography, since color balance may be corrected with camera settings as the image is captured, or by software manipulation afterwards. Colored filters are commonly used in black and white photography to alter the effect of different colors in the scene, changing contrast recorded in black and white of the different colours. For example, a yellow or, more dramatically, orange or red, filter will enhance the contrast between clouds and sky by darkening the blue sky. A deep green filter will also darken the sky, and additionally lighten green foliage, making it stand out against the sky. A blue filter mimics the effect of older orthochromatic film, or even older film sensitive only to blue light, rendering blue as light and red and green as dark, showing blue skies as overcast with no contrast between sky and clouds, darkening blond hair, making blue eyes nearly white and red lips nearly black. 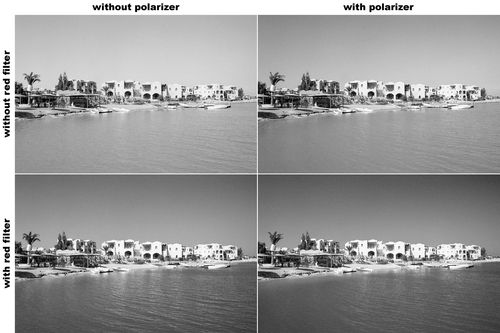 Diffusion filters reduce contrast in addition to softening resolution. Linear polarising filters, while effective, can interfere with metering and auto-focus mechanisms when mirrors or beam-splitters are in the light path, as in the digital single lens reflex camera; a circular polarizer is also effective, and does not affect metering or auto-focus. The filter diameter for a particular lens is commonly identified on the lens face by the ⌀ symbol. For example, a lens marking may indicate: “⌀55mm” or “55⌀” meaning it would accept a 55mm filter or lens hood. The French manufacturer Cokin makes a wide range of filters and holders in three sizes which is collectively known as the Cokin System. "A" (amateur) size is 67 mm wide, “P” (professional) size is 84 mm wide, and “X Pro” is 130 mm wide. Many other manufacturers make filters to fit Cokin holders. Cokin also makes a filter holder for 100 mm filters, which they call the “Z” size. Most of Cokin's filters are made of optical resins such as CR-39. A few round filter elements may be attached to the square/rectangular filter holders, usually polarizers and gradient filters which both need to be rotated and are more expensive to manufacture. Cokin formerly (1980s through mid-1990s) had competition from Hoya's Hoyarex system (75 mm x 75 mm filters mostly made from resin) and also a range made by Ambico, but both have withdrawn from the market. A small (84 mm) “system” range is still made (as of 2012) by Formatt Hitech. In general, square (and sometimes rectangular) filters from one system could be used in another system’s holders if the size was correct, but each made a different system of filter holder which could not be used together. Lee, Tiffen, Formatt Hitech and Singh Ray also make square / rectangular filters in the 100 × 100 and Cokin “P” sizes. ↑ Seth Barton (January 9, 2014). "Sony FDR-AX100 review - Hands on with first consumer 4K camcorder". ↑ "CAMERA LENS FILTERS". Retrieved January 17, 2014. ↑ Joseph Meehan (1998). The Photographer's Guide to Using Filters. Watson-Guptill. ISBN 0-8174-5452-7. ↑ Tiffen Inc. "Protection & UV Absorbing Filters". Retrieved 2011-04-12. ↑ Gary Nugent. "Photoshop Technique: Remove Purple Fringing". Retrieved 2011-04-12. ↑ Canon Inc. "Canon EF 16-35mm f/2.8L II USM Instruction Manual" (PDF). Canon Inc. p. ENG-1. Retrieved 2013-01-04. Since the front element of this lens moves when zooming, you need to attach a Canon PROTECT filter sold separately for adequate dust- and water-resistant performance. Without a filter, the lens is not dust or water resistant. ↑ Canon Inc. "Canon EF 17-40mm f/4L USM Instruction Manual" (PDF). Canon Inc. p. ENG-1. Retrieved 2013-01-04. Since the front element of this lens moves when focusing (zooming), you need to attach a Canon PROTECT filter sold separately for adequate dust- and water-resistant performance. Without a filter, the lens is not dust or water-resistant. ↑ Canon Inc. "Canon EF 50mm f/1.2L USM Instruction Manual" (PDF). Canon Inc. p. ENG-1. Retrieved 2013-01-04. Since the front element of this lens moves when focusing, you need to attach a Canon PROTECT filter sold separately for adequate dust- and water-resistant performance. Without a filter, the lens is not dust or water resistant. ↑ Thom Hogan. "Filters by Thom Hogan". Retrieved 2011-04-12. ↑ Paul van Walree. "Filter Flare". Retrieved 2011-04-12. ↑ Bob Atkins. "UV or not UV?". Retrieved 2007-07-26. ↑ Reichmann, Michael. "Polarizers". Retrieved 2011-08-19. ↑ Dr. Ching-Kuang Shene. "Coated or Non-Coated?". Retrieved 2011-04-12. ↑ Lenstip.com. "UV filters test - Tiffen 72mm UV". Retrieved 2011-04-12. ↑ Schneider Optics. "New B+W XS-Pro Digital Filters". Retrieved 2011-04-12. ↑ HOYA FILTERS. "filter catalog" (PDF). Retrieved 2011-04-12. ↑ Heliopan Lichtfilter. "filter catalog" (PDF). Retrieved 2011-04-12. ↑ Formatt Hitech. "Format Hitech Still Filters". Retrieved 2012-09-30. Wikimedia Commons has media related to Photographic filters.